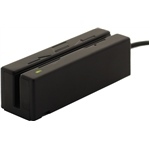 A 3-track magstripe reader with TWO magnetic heads designed to reduce confusion at the Point of Sale. A MagneSafe Secure Card Reader Authenticator (SCRA). Easily interface with PC or terminal with up to three tracks of data from magnetic stripe in the extended path to ensure accurate reads. Economical and compact swipe card reader that needs no external power (except TTLs) to be operated with multiple track configurations.